On the ballot: Edgewater Medical Center Reviewed by Edgeville Buzz on February 1, 2011 . Just yesterday we became aware of a proposed development of the site of the former Edgewater Medical Center. 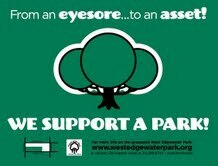 The Friends of West Edgewater Park, a group lobbying to have that same site turned into a City park have notified us that a Park Referendum is on ballots for voters in 5 precincts (22, 33, 41, 42, & 46) in the 40th ward for the February 22nd election.